Then I got to the airport in Nashville last night to find all the flights to Chicago canceled due to a snowstorm. So I spent the night in a hotel next to the airport, twitching and "acking" with my eyes bugged out. Like Bill the Cat. Don't you hate it when you discover your flight has been cancelled right AFTER you turn in your rental car? I could have gone to a movie or something. But no. No car. So I just sat in a hotel room and "acked." I was holding out the hat trying to raise money for a rental car so I could go see a movie. No takers. Everyone thought I had rabies so they stayed away. The recording went well, though, and it was good to see the veggie gang. Kinda bittersweet, since some of them were in their last few days of Big Idea employment. It sounds like many of them will get a shot at freelance work on future Big Idea projects, so their veggie time may not be completely over. In other news, for some reason Entertainment Rights' stock dropped yesterday from 0.8 pence per share to 0.05 pence per share. That's an 88% drop, in case you're keeping score. In one day. The weird thing is there weren't any news items that I'm aware of that could have spooked the market like that. I don't know why it happened. Today the price jumped back up to 0.3 pence. (A 500% gain!) Bizarrely, overnight the market was valuing VeggieTales, 3-2-1 Penguins, Lassie, The Lone Ranger, Casper, Postman Pat and everything else owned by Entertainment Rights at only $700,000. That's less than many of the single family homes around us here in Wheaton. That reflected a 52-week decline in values of 99.6%. Kind of astonishing. Hopefully the stock price will stabilize long enough for the team in New York and Franklin to get some new ideas off the ground. Bob and Larry aren't dead yet… they're just resting. Ack. Cough. Gonna go home and watch a movie with my kids… jelly on! w.Awwwww. I’m sad to see Veggie Tales go, although seeing that it is now owned by a different company does not make it as sad to me, yet it is still sad. Dang! Ya think I could take out a mortgage and buy myself some veggies? Ah…I have felt just like that cat before…I wonder what God is gonna do with VeggieTales now…will be praying. Wow! That’s crazy! I can’t believe that drop. Astounding. Hope you’re feeling better soon. I’d avoid any catnip in the meantime. I was a big supporter of the Opus and Bill ticket in ’84 and ’88. I was disappointed they didn’t run this year. I think they could have won. 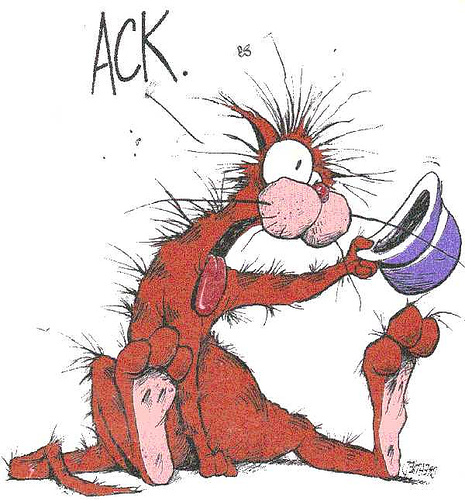 I was, or am, a huge Bloom County fan. PS: Stay away from Steve Dallas. Same thing happened to us coming back from Willow Creek’s Conspire Conference last year. Left the conference a couple hours early to catch our flight (and had to miss Phil’s main session…bummer), left our hotel (which was near a movie theater), turned in ye ol’ rental, then got to the airport to find all flights goin’ down south were cancelled until the next morn. Seems they were freaking out about a few tornados. So we paid like $300 for a tiny room at the airport hotel, then flew out the next morn. I feel your pain. :o) but those are the stories of legend. Wild times. God’s on the move (always). Rest up and stay strong. Crazy times across the board! We are praying. I suspet God has something all worked out down the road. But it does sort of make you want to check the couch for loose change, doesn’t it? I’ve read your book, and the advice on rental cars: so I hope you had rented a Neon! Bear/Booples brought to mind a C.S. Lewis quote from the “Chronicles”…”Aslan is on the move”. Todd, same thing for me post-Conspire conference. Except I turned into a kind of maniac who rode in a car with a complete stranger-man to Wisconsin to catch a flight there at 3:45 am. Yup, after I had returned the first rental car we had to get a second one, so I let that guy pay for it 🙂 I just had to get home to see my kiddos. Then you’re a little horse. And now you’re a cat? I didn’t think we Christians believed in incarnation. Re. Entertainment Right and the value of Veggie Tales. I think people might misunderstand if they think they could buy Big Idea for 800,000$. This might be what the stock if worth. But you could own all the stock and if the company goes bankrupt you would love everything and the debt holders would be the assets. If they have 100 million dollars in debt and the stock is worth less than a million then people value the assets at the value of the debt. Veggie tales is still a very valuable asset, there’s just no one who is willing to invest in that company right now as a simple stock holder if they have all that debt and if the managment does not know what it is doing. Am I right in my evaluation? Some of you experts in finance might be able to help. I hope you feel better Phil. And yay it looks like there’s hope for Bob and Larry. I have to wonder if that “0.05 pence” was a typo. It would make more sense to see a 0.8 to 0.5 to 0.3 progression, don’t you think? (Funny coincidence I’m replying to use, since that’s the screen name I usually use here ) :. You’re right, to a certain extent. However, a hypothetical multimillionaire Veggiefan would not have to spend the whole $800,000: just enough to obtain a majority share, or whatever the bylaws require, to obtain full control of the company (though a complete buy-out/privatization would help). I don’t know Britain’s bankruptcy laws, but corporate bankruptcy in the US protects the assets (look at KMart: it came out of I think 2 separate bankruptcies to purchase Sears, and then a really expensive inventory computer system to rival Wal-Mart’s, ad is now a powerhouse again). But a hypothetical Christian who wanted to own Big Idea (and maybe one or two other ER properties–if it were me, I’d love to get my hands on Big Idea ,Lassie and the Filmation library) could obtain majority ownership and then, by taking control of the board, authorize sale of assets to whomever he wished. He could cherry-pick the assets he wanted, sell them to a different corporation he owned, and then sell the rest of ER’s assets to the highest bidders. Hey Phil, just found your book at my public library. Picked it up due to the mention of failure (the only way up is down, I guess), on the back. Thank you for coming out the other side and writing about it, specifically defining what (who) is on the other side, waiting. Very encouraging! Keep teaching, you’re good.